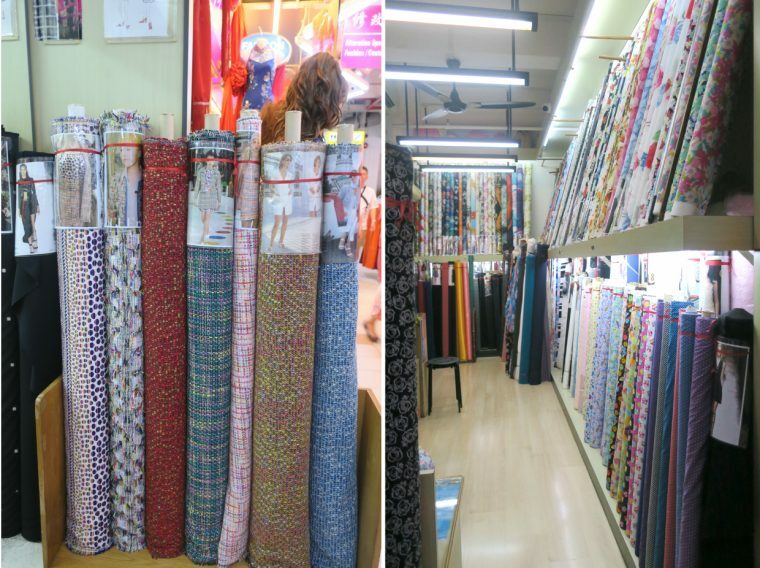 We are back with another contribution to our fabric shopping series from cities around the globe. Today Gayatri is here from Sew She Writes. 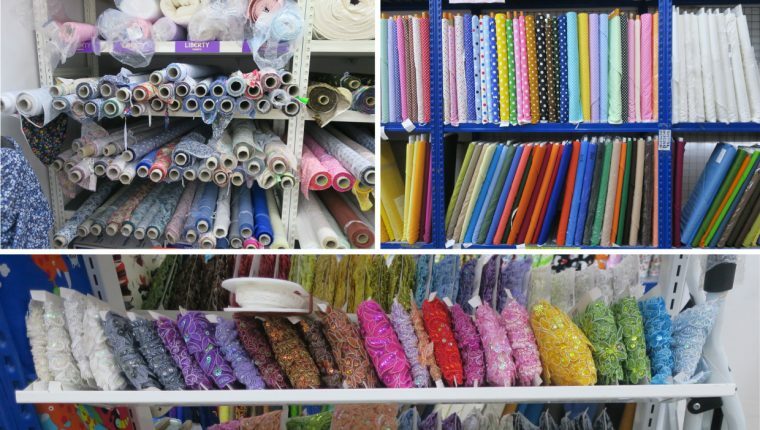 She stopped by in the past with her favorite Oliver + S pattern post, and now she’s giving us a fabric shopping tour of Singapore. Thanks so much for being here Gayatri! Welcome to Singapore! This tiny city state, known as “The Red Dot” (because it literally is a red dot on most maps, so tiny it is! ), is not immediately known as a go-to destination for fabric shopping. But after living here for nearly five years, I’ve discovered a few gems, some by stumbling onto them serendipitously and some from other bloggers. I’ll share some of my favorites with you today. There is one outlet of an Australian fabric store here called Spotlight. I confess it’s not my favorite place to shop in Singapore, but it’s okay for trims, elastics, Guterman thread (the only place I can find it here), and quilting supplies. 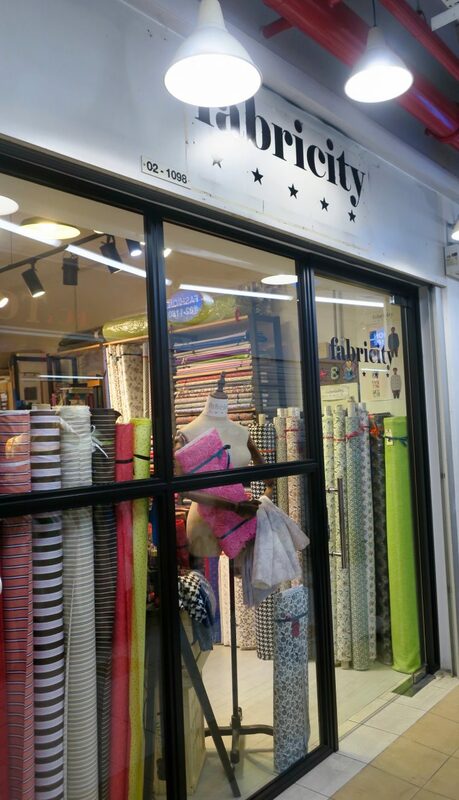 However, if you want to explore the city a bit more, there are lots of other places that can satisfy your sewing needs at lower prices with (marginally) better service. First up, Arab Street. 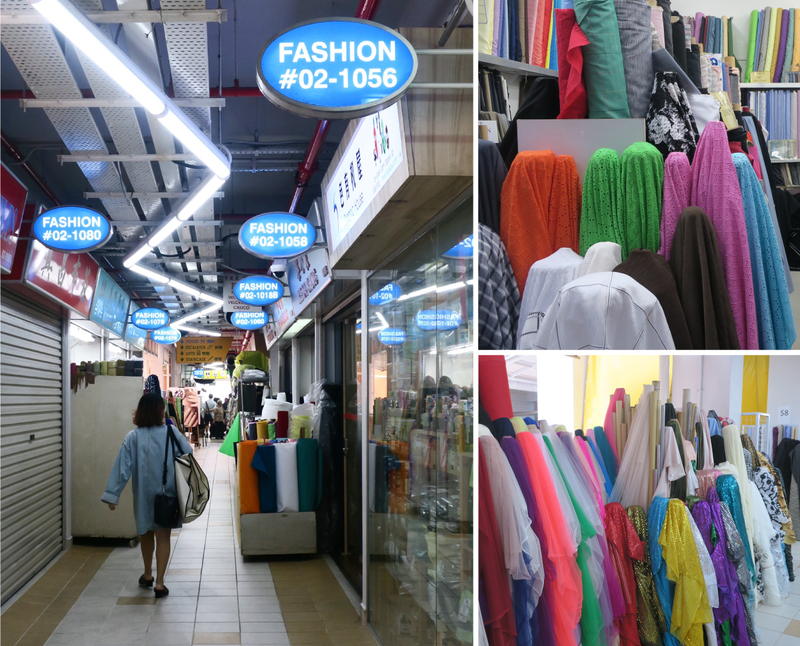 Between Beach Road to the south-east and Victoria Street to the north-west, this entire stretch of Arab Street is lined with fabric stores and tailoring shops, interspersed with places to buy Persian rugs and knick-knacks from the Middle East. Arab Street is where to go if you have cash to spare, and/or are looking for special occasion fabrics. Expensive French lace, beautiful silks and wool, high-end Egyptian cotton for shirts, chiffon, silk crepe, Italian designer fabrics–you’ll find it all here. Bargaining isn’t generally “done” in Singapore, but a little haggling seems to be acceptable on Arab Street. 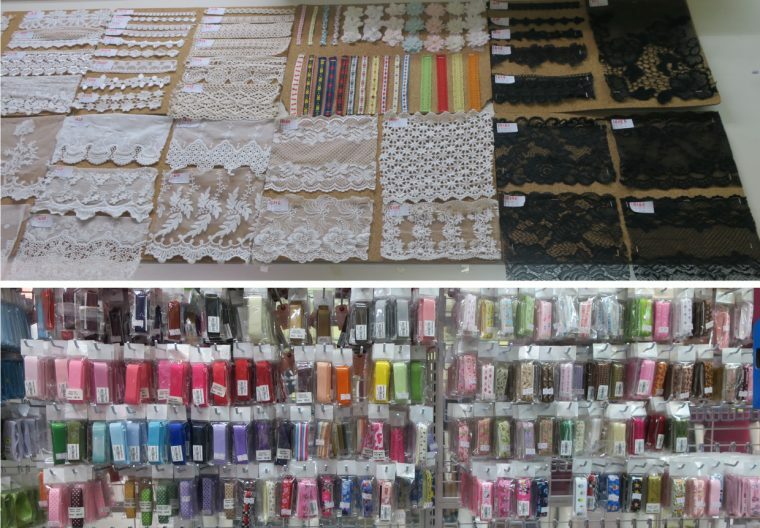 I confess that I don’t come here often (I’m not usually in the market for silk, chiffon or lace! ), but it’s fun to wander once in a while. If you dig around a bit, you can also find good deals. Most shops are long and narrow, some with two levels, so it’s worth the time to delve a bit deeper. Admittedly, the sales people can seem a bit too welcoming at first, but if you assure them several times that you’re just browsing, they’ll probably leave you alone! One of my favorite places to shop for fabrics is in Chinatown. 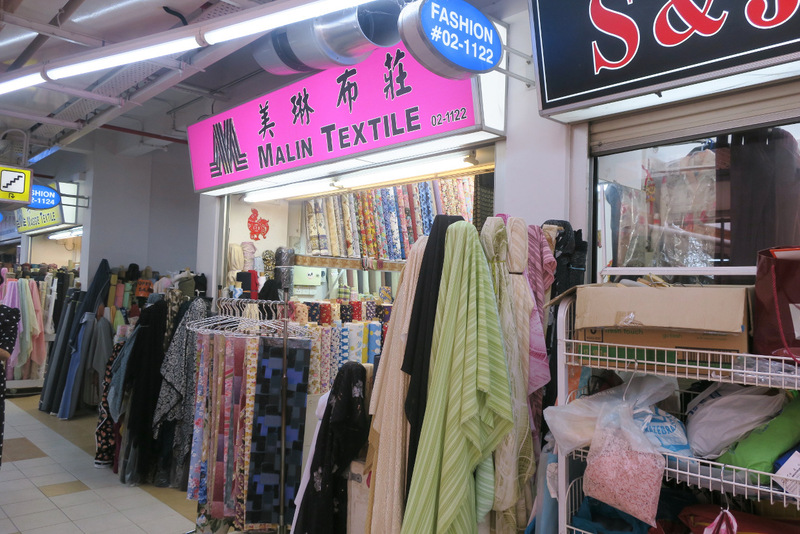 The majority of the fabric stalls are in the People’s Park Complex market (not to be confused with the People’s Park Centre, across the street, which also has fabric stores!). There is nothing fancy about fabric shopping in Chinatown (no air-conditioning!). The good news is that the prices are great. For $6 (SGD)/meter, you can get a great selection of Japanese cotton. For just slightly more, you can find a variety of linen, denim, wool blends, and some silks. If you need to make a fabulous tutu, here’s where you’ll find tulle in all shades. Sparkly fabric and sequins? 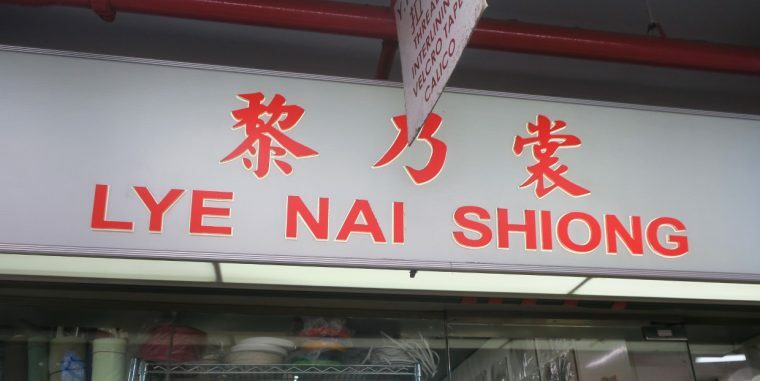 Chinatown has you covered. The only thing hard to find here is a good selection of knit fabric. And nothing opens before 11am, at the earliest! Here is a quick list of my favorites. 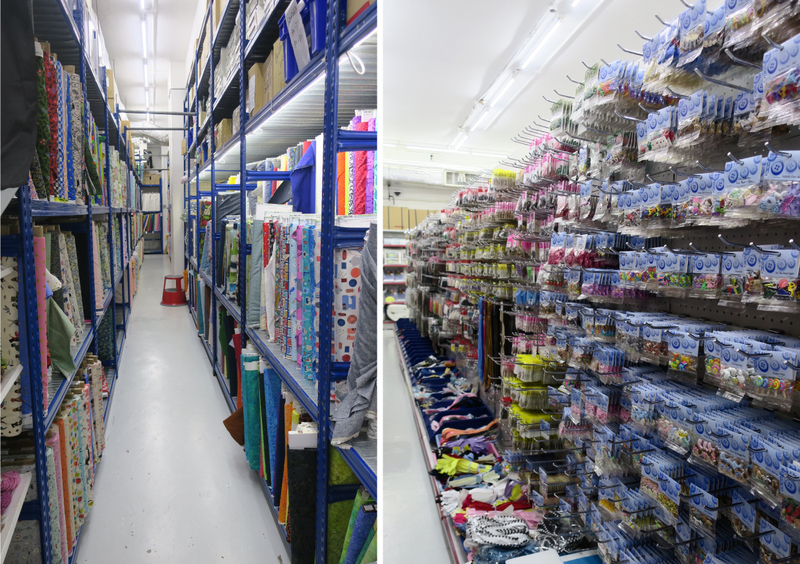 Malin Textiles: very friendly service, good selection of Japanese cotton, canvas blends, crepe, lightweight wool, and polycotton blends for making test garments for just $3/metre! Lye Nai Shiong: for all your notion needs, from zippers, thread, elastic, interfacing, trims, laces, buttons and needles, to name a few. The service is variable and the store is always busy, so it’s not a great place to just browse, but perfect if you know what you need. Terence and Sylvie: a small shop, and not the cheapest, but they have a good selection of European fabrics (linens, suiting fabric, voile). 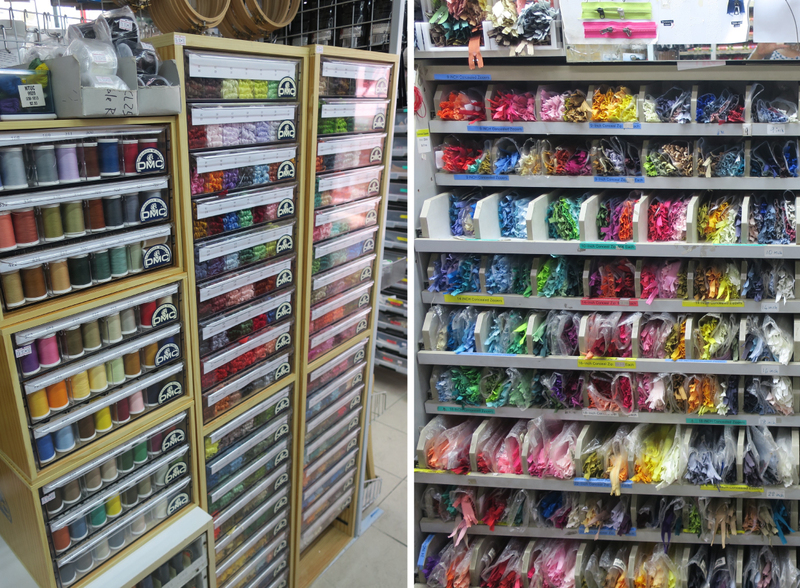 Brighton House Accessories: a funkier shop than Lye Nai Shiong for trims and sewing tools, and lots of choice for buttons (and you can buy them individually). They also carry a great selection of Japanese cottons of varying weights. Just occasionally, I’ve found a few bolts of Cotton + Steel fabric here too. You know it’s expensive in Chinatown when it’s behind glass doors and has air-conditioning! Nicole Xavier and Fabricity are two of these stores. 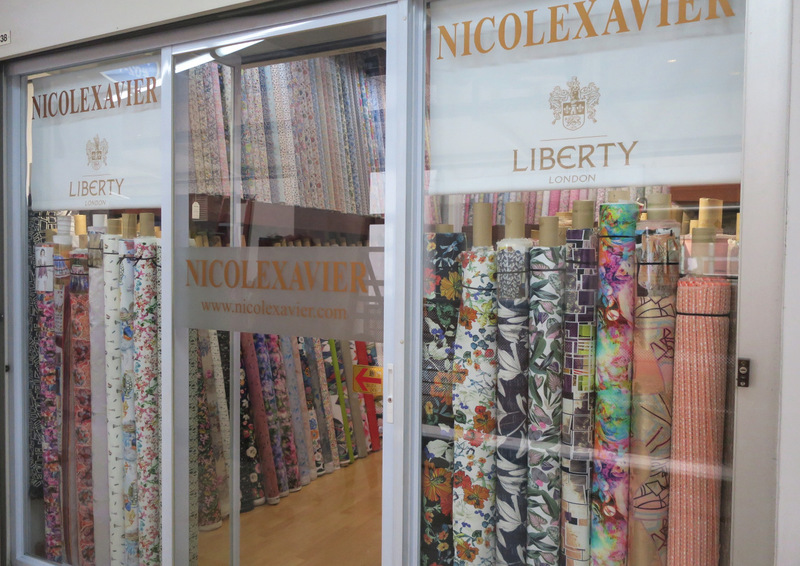 Nicole Xavier almost exclusively carries Liberty Tana Lawn (only the current and the previous season’s collections), with a few other high-end fabrics from Europe. Their Liberty fabric is not cheap, but it’s a fun store in which to gaze adoringly at all the lovely prints. Fabricity also has beautiful fabric. The selection is limited, but you can find some good deals, and the service is excellent. And finally, we come to Sing Mui Heng. They have two stores, one in the People’s Park Centre (across the road from the stores mentioned above), but their bigger warehouse store is in the Outram/Tiong Bahru neighborhood. The store is in an odd 15-storey warehouse building with an amazing collection of home furnishing and antique stores. I found this fabric store by accident, but what a great find! Most of their fabrics are woven, but they are starting to carry a great selection of knit fabric, minky, double gauze, and some flannel. Their woven fabric selection (all cotton) is extensive (including Robert Kaufman, Riley Blake, Tilda, Leicen, Art Gallery Fabrics, and others). They also carry interfacing, trims, buttons, quilting supplies, and have recently started carrying Liberty fabrics as well. It’s all well displayed and organized, and the staff are fairly knowledgeable. Not all of them speak English well, but there’s always an English-speaking staff member on hand to help out. I have a hard time visiting this store without buying something! Phew…. I think that’s about it. For a small island, there are a surprising number of places to keep any fabric enthusiast happy. Thanks for coming along! Wow, great article, so inspiring! Well done, Gayatri! Thanks for this guide – it’s great! I’d like to add, if you are interested in linen, Sterling Textiles in Chinatown had a great selection at excellent prices when I was there a few months ago. The vendor was helpful and pleasant to deal with too, even when my husband went back a couple of months later on his own while on a business trip, to get me some fabric. They are at the Peoples Park complex, #02-1108, close to Malin Textiles. Thank you for such an informative article. We are going to Singapore in March to visit our son. 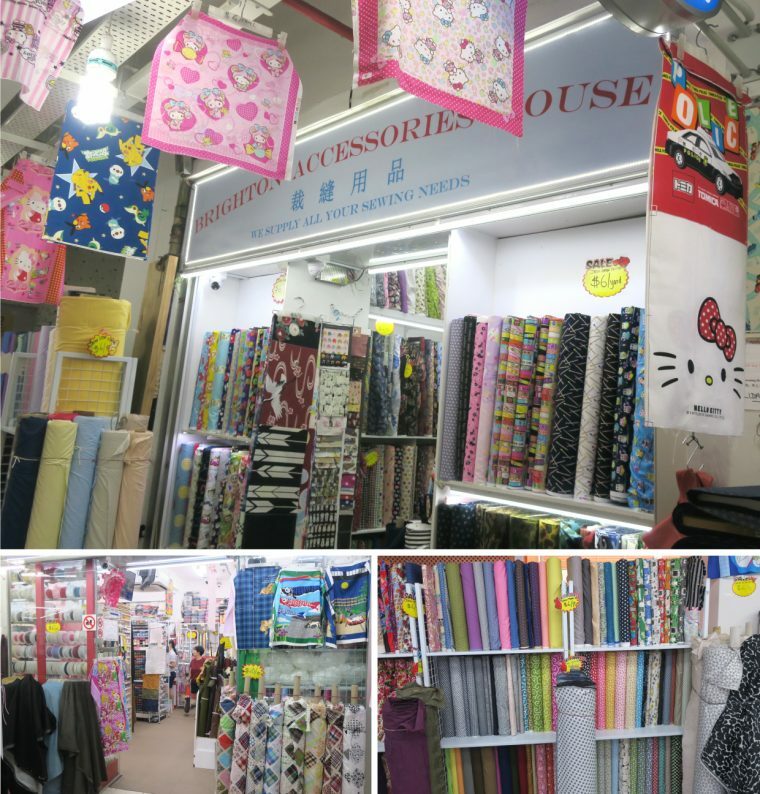 I have tried to research fabric stores in Singapore but with very little success. This will be so helpful!! Thanks Mel! There are so many places in Chinatown and it’s hard to know (from the outside) which ones are good. I’ll definitely check out Sterling Textiles next time I’m there! I love this article! I’m often found in the People’s Park Complex waiting for places to open! The lady in Malin Textiles is always so friendly (and delighted when my girls come in wearing something made from fabric bought on a previous visit). Brighton House sells the most marvellous bobbin storage cases, which I’ve never found anywhere else. 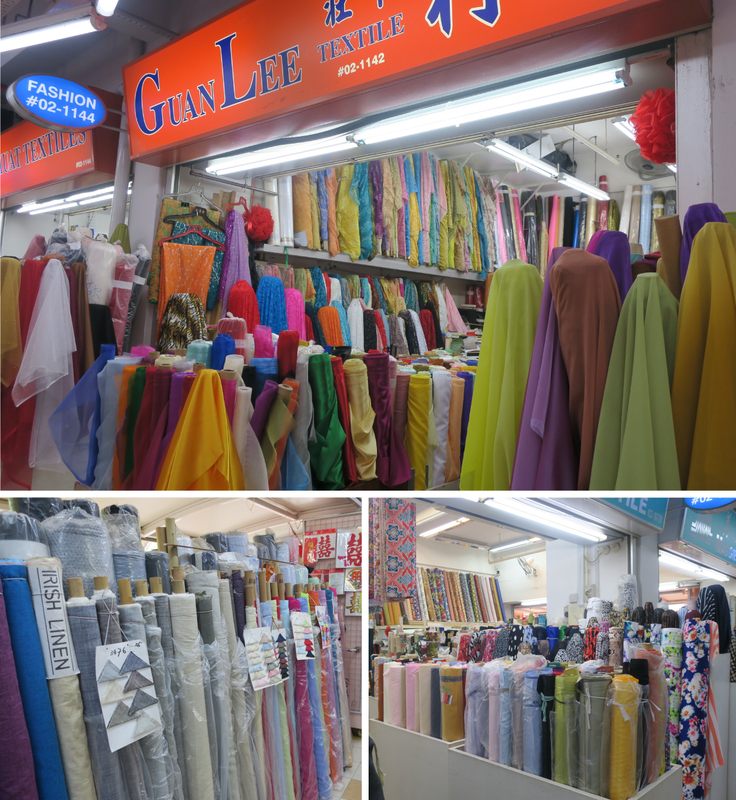 In the Arab Street area I’ve also found one store around the corner on North Bridge Road (turn left towards Bugis) which has the most amazing range of broderie anglais fabrics in a huge range of colours and fabrics. Next time I go I will try to find this store. Thanks so much for this article. It really jocks the memory. 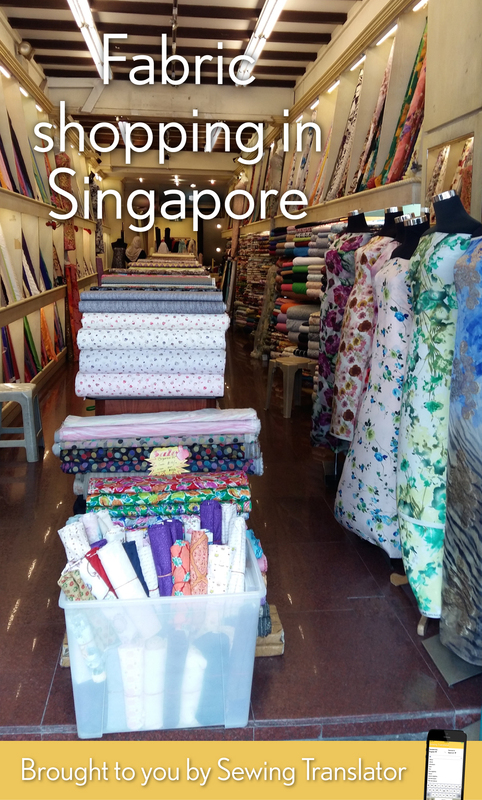 Singapore is a fabric shoppers paradise. Even if you sometimes have to pay a little bit more than in Australia. The quality is way better. Hopefully we will travel there again next year. So hubby knows what is coming back with me. Enjoy all the awesome shopping!! I noticed how impeccably clean every store seems to be – I live near LA and can’t think of many stores that are so tidy and organized. Thank you for the wonderful pictures and photographs. I felt like I was on a vicarious shopping expedition in your lovely country! I live in Singapore and mostly go to Arab Street. Thanks for the suggestions in China Town as I have only been once and shopped at Nicole Xavier. I find it overwhelming and the service sometimes too much when they follow you around and don’t give you a chance to look. Hi! I live in Kuching and while there are some good fabric stores here, they don’t stock knits. I want to buy some ponte for a UK winter wrap dress. I will be in Singapore this weekend. Which fabric store do you think will most likely have nice ponte in stock? My husband will be with me and won’t be tolerant enough for me to visit more than one or two fabric shops….